Stones and various other missiles were also directed at police as around 200 people attended the 1916 Easter Rising commemoration in the Creggan estate yesterday afternoon. Federation chairman Mark Lindsay described the violence as “appalling and disgraceful”. Mr Lindsay said the dissidents behind the attacks will not succeed in causing mayhem, and added: “They only know how to wreck and undermine. They are bankrupt thugs with nothing but misery to offer a community. They cling desperately to a past, unwilling to recognise the gains that have been made and unwilling to imagine a better future for the entire community. Yesterday’s parade was led by masked men in paramiltary-style uniforms. 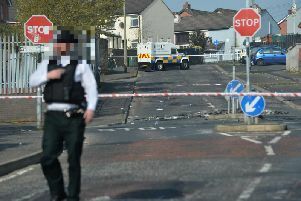 A senior PSNI officer said video footage of the attacks will be examined in an effort to bring those responsible before the courts. Foyle MLA Gary Middleton also condemned those behind the violence. “Nobody has a desire to see the violence on display today, except for barbaric thugs intent on endangering life and property,” he said. Chief Inspector Ivor Morton said the parade organisers had declined PSNI attempts to engage in discussions ahead of the commemoration. Ulster Unionist MLA Doug Beattie said: “While calling for the PSNI to take robust retrospective action against the organisers of this illegal parade and those in paramilitary uniforms, I also call on the judiciary to set a penalty that fits the crime. Alliance MLA Stewart Dickson said “illegal parades involving masked men aimed at glamorising the past can never be tolerated”. There are no reports of anyone having been injured or arrested as a result of the disorder. At the same time as the violence erupted in Londonderry, a major Apprentice Boys of Derry parade in Antrim town passed off without incident.